“The Insect Apocalypse Is Here!” This is not a blockbuster starring Dwayne “The Rock” Johnson, but the title of a November 2018 New York Times editorial that summarized some worrying trends in biodiversity conservation. Several recent studies from places as different as South American jungles and Germany have documented enigmatic, sharp declines in insect populations. And therein lies the problem that Ohio University Biological Sciences researchers Dr. Bekka Brodie and Dr. Viorel Popescu are trying to address. 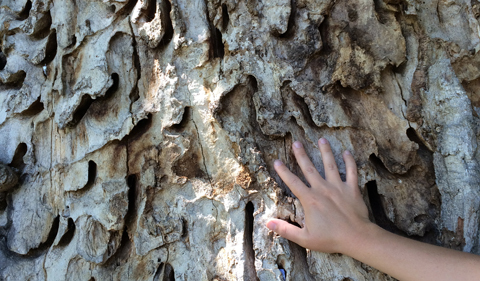 As eaters of wood, are long horned beetles human’s friends or foes? Some people consider them “friends” because they are biological indicators for forest health and perform the important ecosystem services by tunneling through and consuming wood…. These are nature’s recyclers. Some consider them “foes” because their tunneling abilities affects the quality of timber and the bottom dollar for the timber industry. As such, there is a grey area between “damage” and “ecosystem service,” which makes the conservation of these beetles tricky. Either way, management starts with learning about the types of beetles living in forests, how many are there, and whether they are common or rare and worthy of advocating for their conservation. Damage or Ecosystem Service? Tunnels caused by beetle larvae. 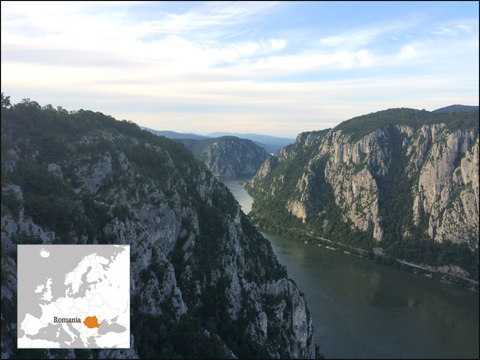 To assess the diversity of long horned beetle species, and their abundance, Brodie and Popescu turned to a unique Eastern European landscape in southwest Romania, the Iron Gates Natural Park. This protected area was shaped by millennia of human habitation and harbors high levels of ecological and cultural diversity. 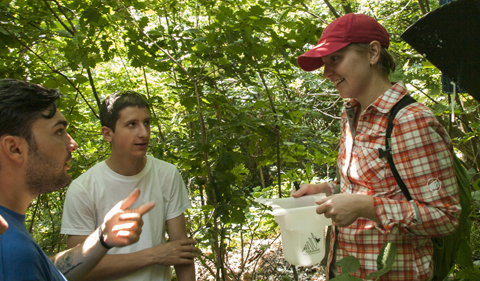 The two researchers worked alongside colleagues from the University of Bucharest, the environmental NGO Association for Biodiversity Conservation and several agencies, businesses and academics in North America to develop a rapid, non-lethal survey method for evaluating long horned beetle communities and estimating beetle abundance. The novelty of the method consisted in capturing beetles alive with novel pheromones lures and traps that intercept their flight paths. Traditional methods for capturing beetles are inefficient and often lethal, which is not ideal when evaluating rare species in need of conservation. The researchers checked the traps every other day and released the beetles, then used sophisticated statistical models to determine abundance and rarity of species. 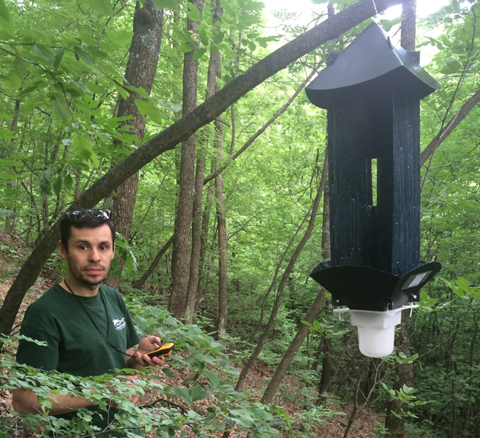 Dr. Popescu with flight intercept trap. Beetles are attracted to the trap baited with pheromone lures, hit the black panel, and slide down into the white cup. 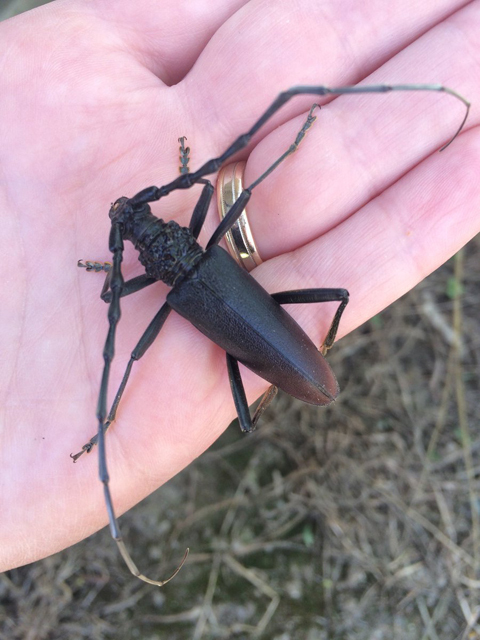 The research team found 28 species of long horned beetles in their traps in less than a month, and they were able to assess which ones were rare or common, and even detected an invasive species. They also found several charismatic species of conservation concern in the European Union: the beautiful blue Rosalia long horned beetle and the metallic green Maple long horned beetle, as well as the main culprit of wood tunneling (the “foe”), the Great Capricorn beetle. This is a massive two-inch beetle whose larvae dig half-inch wide tunnels in both dead and live wood. Dr. Brodie at work in the field. While the researchers were not able to solve the “friend” or “foe” dilemma, they highlighted interesting ecological patterns and set the stage for the adoption of new monitoring methods to estimate beetle abundance, describe the long horned beetle community, and effectively map a conservation pathway. 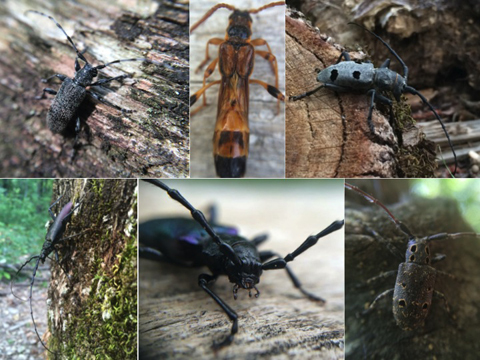 Their findings are being integrated into the Iron Gates Natural Park management plan, and this preliminary work is currently being developed into a much larger long horned beetle conservation project in Romania that will attempt to reconcile the conservation and management of these important species. The team benefited from a small grant awarded by the Mohamed bin Zayed Species Conservation Fund and logistic support from the Center for Environmental Research at the University of Bucharest, while USDA Animal and Plant Health Inspection Service (APHIS) provided the traps and Synergy Semiochemicals, a Canadian company, provided the pheromones. A five-minute educational movie produced as part of the project can be seen on YouTube. The scientific paper is published in the June 2019 volume of journal Ecological Indicators: Brodie, B. S., V. D. Popescu, R. Iosif, C. Ciocanea, S. Manolache, G. Vanau, A. A. Gavrilidis, R. Serafim, and L. Rozylowicz. 2019. Non-lethal monitoring of longicorn beetle communities using generic pheromone lures and occupancy models. Ecological Indicators 101:330–340.